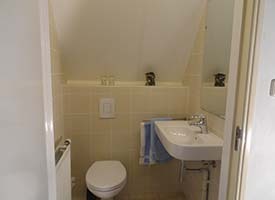 Each room at Bed & Breakfast De Joppeheuvel has its own sanitation. 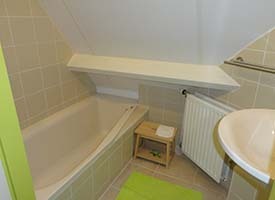 Two rooms even have a lavatory separate from the shower facilities. This is ideal for par exemple two friends that are together for biking and walking. 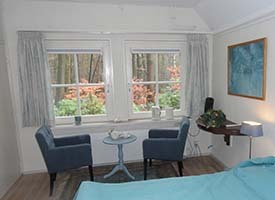 Each room has a sitting area with comfortable chairs where you can enjoy the view over the garden or where, in the winter and spring room TV can be watched. Internet is avialable all over the B&B. In Every room coffee and tea can be made. The fridge in the breakfast room is available to guests. The winter room is on the ground floor and gets in the morning beautifully filtered light in from the forest east of the house. 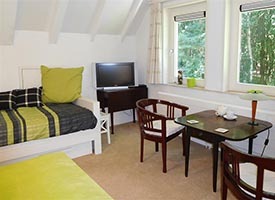 This room features a large double bed and private bathroom with shower, sink, toilet and television. 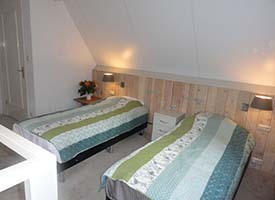 The summer room has two single beds, which can be pushed against each other. 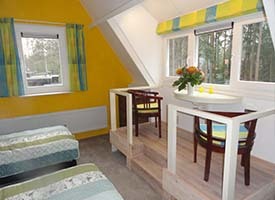 The room has an indoor balcony which can be lovely to sit on to have a beautifull overview over the garden. The room has a toilet with sink and a separate shower. The room has no TV. 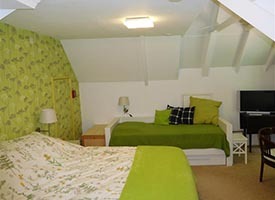 The spring room is bright green in color, spacious and playful in design with different height ceiling and beams. The room has a a large double bed. The room also features a sofa bed, a full bed of 90 x 200 cm. Therefore, it is suitable for 2 persons ( together or separately), possible with a child up to 10 years. 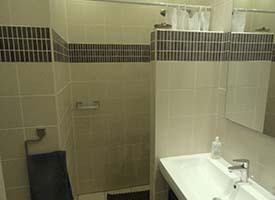 The Bath room has a bath with an inside shower and a fitted wash basin. The toilet is in a separate room in the spring room . The room also has a TV. 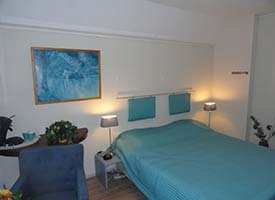 Each room costs 80 euros per night for two, including breakfast and taxes. A room costs 65 euros for use by one persoon. From the fourth night you pay 10 euros per room less. This applies only when occupied by two people. The hosts like to participate in organizing group arrangements. Reserving one or more rooms can by sending a e-mail or by calling to 06-10867850.